There seems to be a void of edible options to quench 4pm hunger besides for junk food: cookies, chips or candy. I find myself constantly on the lookout for healthy and tasty snack options, since vacuum-sealed apple slices and hemp bars just don’t cut it. Fortunately, I was recently introduced to kale chips. 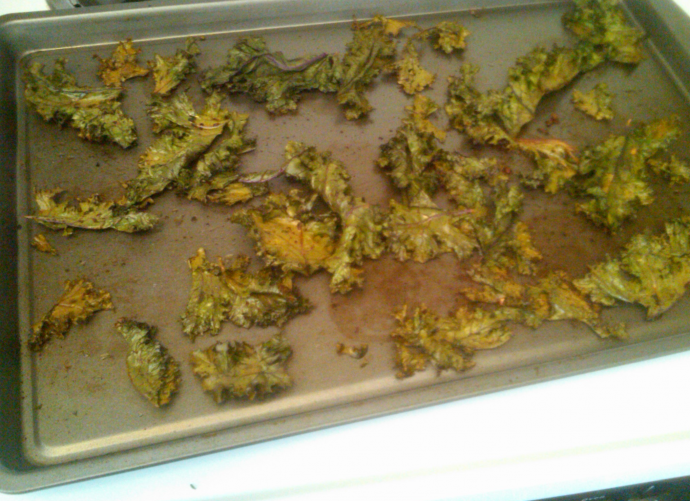 While originally a popular snack amongst vegans, kale chips really ought to go mainstream. Kale is very healthy: it is said to have anti-inflammatory, antioxidant and anti-cancer properties, and in chip form, kale is crispy, salty and satisfying. The best part? These chips are easily made in 20 minutes. Zoe McKinnell is a senior at Brown University who is currently very excited about cooking food that has been sitting in her freezer for too long. Preheat oven to 300°F. Rinse, dry and remove stems from kale. Chop kale into pieces about 2 inches wide. Toss with olive oil, soy sauce and red pepper flakes. Arrange on a baking sheet. Bake for about 20 minutes or until chips appear crispy. I agree. They are delicious and a great snack food. I would have never thought of adding soy sauce. Great idea. Thanks for the tip.